Looks like The Convenience Store has some competition. Kokon to Zai will be opening another store on Golborne Road, just off Portobello. 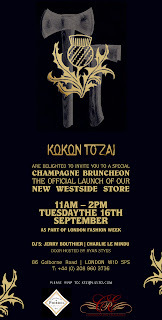 I'll be checking it out on Tuesday during LFW at their "Champagne Bruncheon" - lovely! The Greek Street store stocks designers such as Cassette Playa, Jeremy Scott, Material Boy, Noki and Raf Simons as well as their own brand KTZ. This is what West London has been missing - why didn't they think of this sooner?